NYCC #6 – the host of the most – of anything sci fi! 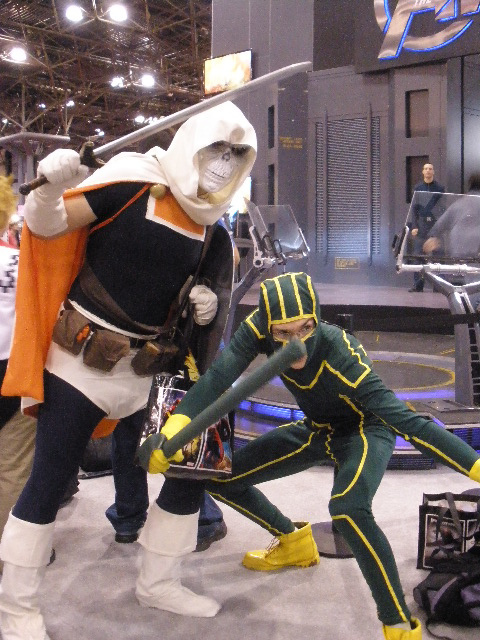 Lover of sci fi that I am, the coming of the New York Comic Con in 2006 was like water for the thirsty. I can hardly wait for NYCC#7! Yes, I’m a Founding Attendee of this second biggest multimedia sci-fi convention in America (San Diego Comic Con is first – for now). And yes that meant I transcended the trauma of that first show where hundreds of ticketed fans couldn’t gain entry due to overcrowding! That was all straightened out by the second show and needless to say I was hooked. The guests, the panels, the vendors, the fan pageantry – the fans showed up and wanted it all. For three years we managed to make the VIP deadline and this year, nada. Woe, woe is we. There is no nicer advantage to have than getting in first to the vendors and IGN, having a lounge and getting a cool official Con swag bag. How cruel is fate to distract my finger from dialing at the critical moment. So we have to plan (well, differently than before anyway). First off, we do have 4-day tickets which is VIP-light; we get to do Thursday with VIPs and press and go to the party opener. That Thursday kick off was a jumper last year and definitely want to do that again. Then we plot line-queuing strategy; how early is too early? Rest assured there will be a long line by the time the sun rises on that Friday. Dawn? Midnight? Three a.m.? It’s a wrap; stay tuned to see if a comics con Faery grants our fondest geek-wish. Or – see you at The Con!